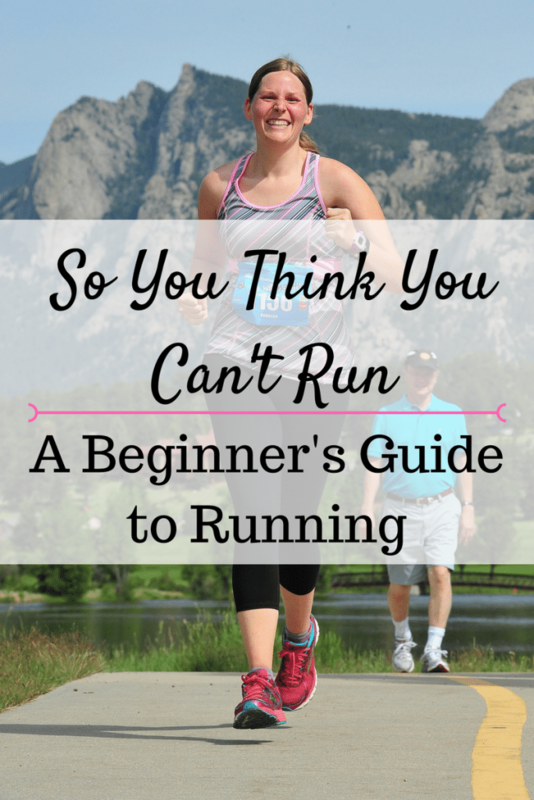 Think you can’t run? You can! Check out this beginner’s guide to running and try these easy first steps to get you on the road and running your first 5k! I hate running. I could never be a runner. I don’t know how people do that. It just doesn’t come naturally to me. It’s too hard. But what about my knees? Have you ever said any of those things? Yeah, me too. Actually, they were kind of my mantra for years and years, dating all the way back to my birthday in Kindergarten when I pretended to be dead asleep to avoid going to P.E. Even as an obese kid, I really enjoyed playing sports. The energy, focus, and challenge of volleyball games and tennis matches were awesome, but in between the games were the dreaded practices. And every practice required a warm-up run. Then running in between drills. Then, if the coach was feeling especially spunky, they’d add in the extra torture of sprints, suicides, and an endless string of laps around campus. I hated running. I was really slow (have you seen those t-shirts that say, “I run. Slower than a herd of turtles stampeding through peanut butter, but I run.”? <- That pretty much sums it up). It hurt my legs, my lungs, and my pride (finishing last time and time again sure wears you down), and I did everything in my power to avoid it for approximately two decades of my life. 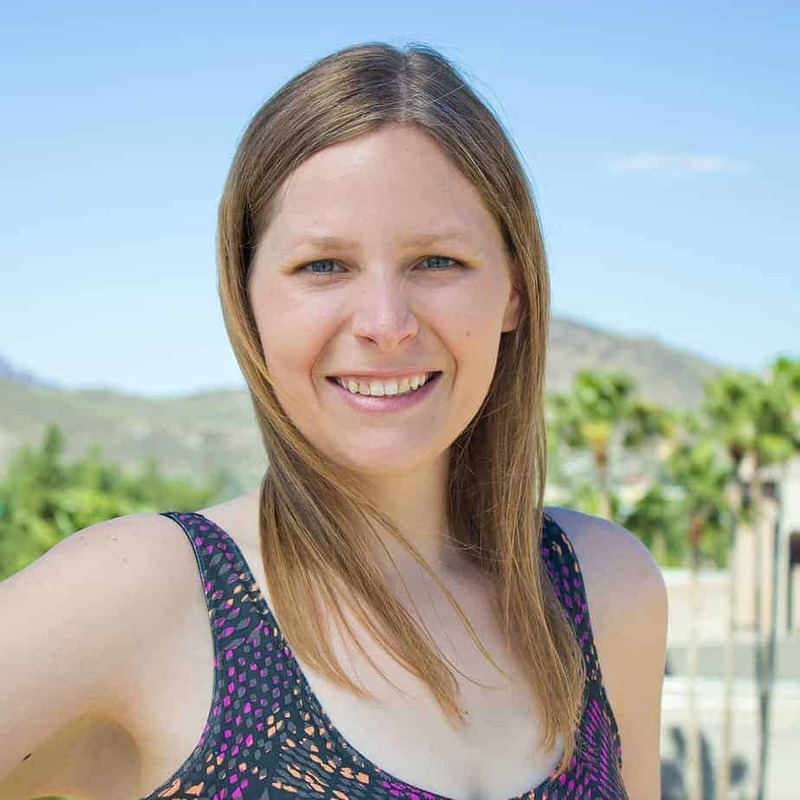 Then, I started running on purpose in 2012 when a couple of food bloggers put together a group called the Red Faced Runners. We were just a bunch of bloggers from all across the country at all different fitness levels who were training to run a 5k on the same weekend together. And I made it! I ran that first 5k. And when I saw that I was actually capable of running, it made me want to do more. Since then, I’ve run a half marathon (13.1 miles), all kinds of 5ks (3.1 miles), and now I willingly choose to run three mornings a week (I know! Who would have thought?). Just like I accomplished everything else in my weight loss journey – one small change at a time. 1. Find a plan to follow. were still pieces of the program I just couldn’t do. I couldn’t run for as long as they wanted me to at the time and certainly not as fast. Maybe there are people out there that can go straight from couch potato to running a 10-minute mile pace in four weeks, but that certainly wasn’t me! 2. Tweak the plan to work for you. When I was frustrated enough with repeating the same training weeks over and over again, I finally decided that I was just going to race against myself with every run. I started keeping track of my pace with the Nike+ app on my phone. I ran almost the same route every time and I paid attention to the places I stopped for walk breaks and how fast I ran in between. Each time, I would try to go just a little bit farther. If I stopped at the fire hydrant last time, I’d make it all the way to the end of the block the next time. Just a little bit farther than last time. Just a little bit faster than last time. Supportive people don’t just fall into your lap – you have to build a support system! 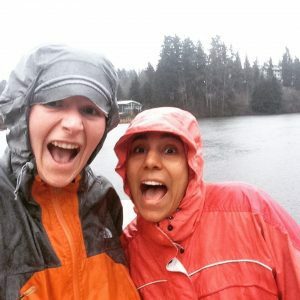 I talked to my Boston-marathon-running best friend Maryam about it and peppered her with questions about shoes, water, races, and training plans. It was really tempting for me to keep my training a secret because then nobody would have to know if I failed, but I never would have been able to do it otherwise. I needed those “Way to go!” and “Good run!” comments on Instagram, and the “Everybody has bad runs” and “Next time will be better” encouragement when a run just felt all-around terrible. 4. Have a goal in sight. 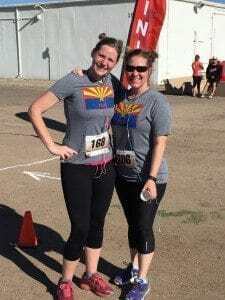 I really wanted to run a 5k race. Now, a lot of that excitement was because I had been running “with” a bunch of the other ladies in the Red Faced Runners group and their excitement was contagious! But another part of it was me wanting to prove to myself that I could do it. I wanted to overcome and conquer this crazy hard thing that had brought so much dread and anxiety into my life, and in this case, that looked like me running across a finish line. good running shoe and if you go to your local running store, they are usually pretty awesome about telling you if you need a certain insert or type of shoe for your pronation (the way your foot rolls as you walk or run). 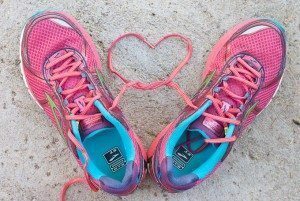 My favorite running shoes are Brooks Adrenalines (especially when they are bright pink!). The most comfortable running socks I’ve found are Balega Hidden Comfort. 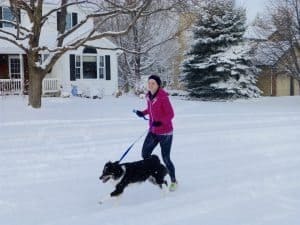 I mostly wear moisture-wicking running clothes now, but I started off with a simple pair of workout capris and a t-shirt and it worked just fine! These ODODOS running pants & capris are great (and super slimming)! I always recommend keeping your phone with you when you’re out running. It’s great for safety purposes, your training plan/app, a map in case you get lost, a camera to take pictures (I have seen some of the weirdest and most beautiful things out on runs! ), music for entertainment, and if you were to sprain an ankle or get caught in a freak lightning storm, you should always have a way to call for help. I use it to carry my phone and my keys because I hated trying to tie my key to my shoelaces and hold my phone in my sweaty hand. You can also use it for tissues, money, gloves, and more. The Garmin Forerunner is fantastic for tracking your runs. It records your pace, distance, time, and so much more. It’s so motivating to see your progress as you get faster and run longer! 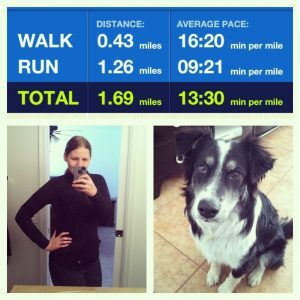 If you are going to run with your dog, I can’t recommend this enough! Holding onto a leash with your hand can really mess with your form. And, as a bonus, if your dog pulls (mine runs great with me, but loves to lunge at squirrels and rabbits), the bungee cord really absorbs a lot of the pulling! What Plan Should I Follow? There are a ton of other options out there if that one doesn’t jive with you. The c25k plan is a good option and you can always look at a few and combine their recommendations to create your own! I just recommend starting out slow and steady. Don’t kill yourself on your first week of running, because you are just going to end up unmotivated, exhausted, and injured. It’s so much better on your body and your mind when you ease into it. when I took his workshop the day before my half marathon, but this guy knows what he’s talking about. 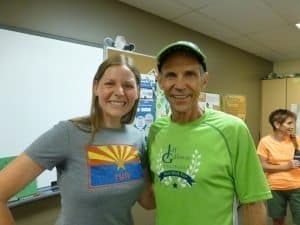 He is a US Olympian (1972) and he is all about promoting the run/walk method. That method is all about injury prevention and taking care of your body. He starts you off running 5 seconds at a time. You can totally run for 5 seconds! This is something that I still catch myself doing, but it just wastes your much-needed energy, so every mile or so I do a body check. If your jaw, your shoulders, or your fists are clenched, shake it out and try to relax them. Imagine you are holding a potato chip in your hand that you don’t want to crush. Stand up with your shoulders back and set your gaze in front of you. If you are looking down all the time, you have to crane your neck and it causes you to hunch over (which makes breathing harder) and lean forward (which messes up your running posture and makes you more prone to injury). Try to avoid pounding your feet against the pavement by landing on your mid-foot underneath your body (not way out in front of it), and pushing yourself forward. Try to keep your arms bent at about 90 degrees and swing them naturally backward and forward, not across your body. Have a person that you can text for cheers on your great runs and encouragement on the hard ones. Join a 5k training group, either online or in person at your local running store. know someone is waiting for you!). I still get race happy when I look at all of the fun 5ks out there! 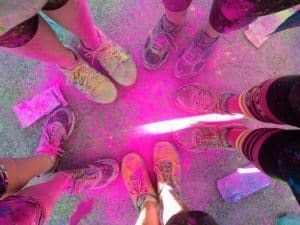 There are color runs, glow runs, hot chocolate runs, donut runs, fro-yo runs, vineyard runs, superhero runs, and zombie runs. Search for the races in your area or find a race in a place you want to visit anyways and make it a part of a fun getaway! What do you want to get out of running? Do you want to experience the runner’s high? Get a good cardio workout? Sleep better? Improve your cognitive ability? Strengthen your joints? Burn calories? Improve your mood? Boost your confidence? ALL of these (and more) are possible, but it takes time and consistency. You don’t reap all of the benefits after just one run. Try to drink about 20 ounces of water a couple of hours before you run. You don’t really need sports drinks when you’re just starting out. My favorite way to warm up is just by walking for a few minutes to get my body moving. If you are going to stretch, choose dynamic stretches that incorporate movement, NOT static stretches (save those for after the run). Don’t fall into the trap of thinking that running gives you permission to eat whatever you want! It does give you some wiggle room, but don’t go crazy. 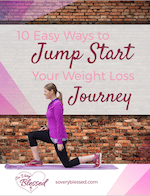 You burn about 100 calories for every mile that you run, so keep that in mind! Living off of junk food makes running so much harder. When I started eating less french fries and more vegetables and lean protein, it got rid of a lot of the discomfort and put extra spring in my step! I have to wait about 2 hours after eating to run or else I get horrible stomach cramps. I have other friends who prefer to eat something small close to the time of their runs. Play around with what works best for your body. Aim for 3 runs a week. If you can only run once a week, awesome! If you can only run twice a week, there is still a ton of benefit! I’ve found three times a week is my sweet spot (and studies back that up), and that’s the frequency I recommend most often. Find your way of running. I used to put “runners” in this little tiny box consisting of only slim and trim elite athletes. Break out of that box! You don’t have to run a marathon or a 10-minute mile. You know those thoughts that are telling you that you can’t do it, you’re not fit enough, and you’ll just be too slow? They’re wrong. Just take it one step at a time, no matter how far, no matter how fast. Run with music or without. Run with friends, your dog, or by yourself. Run on a treadmill, in your neighborhood, or along mountain trails. Run races or just for fun! It’ll be tiring, especially at first, but it is also so empowering and it does wonders for your self-confidence. Keep going until you find your way of running. If you are even just a little bit tempted to try running, DO IT!